Olly Explores 7 Wonders of the Chesapeake Bay, written by Elaine Ann Allen and illustrated by Kelli Nash, is an age-appropriate and fun way to introduce young children to the marvels of the Chesapeake Bay and its wildlife, infrastructure, and history. With the curious Olly the Oyster who is looking for adventure, children discover that following the current leads to many wonders big and small. With interactions with Mr. Snail, Mrs. Blue Crab, and others, Olly learns about the Chesapeake Bay ecosystem in language that is informative and friendly. Kelli Nash’s illustrations are gorgeous with attention given to every fin, feather, or clawed friend with whom Olly engages. Nash uses washed blues, greens, and yellows as her primary colors around the carefully-drawn sea creatures and renders the Cape Henry lighthouses and skipjacks with equal accuracy. There is even a simple map showing tributaries and some landmarks of the bay. 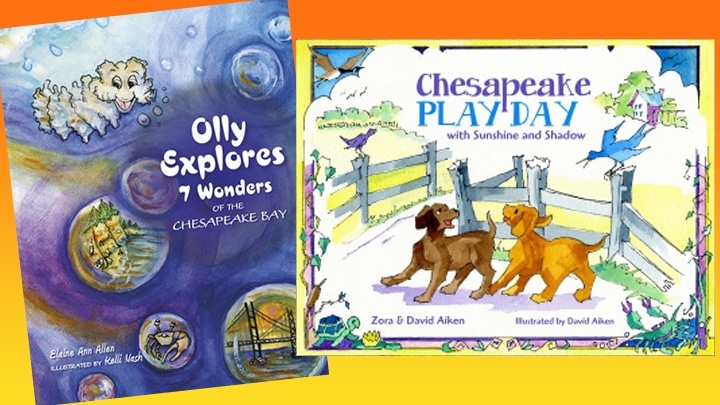 Chesapeake Play Day, written by Zora and David Aiken and illustrated by David Aiken, is a gentle story set on the Chesapeake Bay told in rhyme. The story centers on Sunshine and Shadow, 2 high-energy farm pups on a quest for a new spot to play. The dogs meet fishermen, horses, crabs, and other denizens of the bay and get into some canine trouble as they explore. The rhyming is particularly clever and will appeal equally to children and caregivers, especially when read aloud. David Aiken’s illustrations are bright and busy with dog action and scenes of the bay with a faintly retro style that is reminiscent of drawings from some mid - 20th century children’s books and should please those who grew up in the 1950’s and 60’s. Both books are for readers ages 5 to 8 and are published by Schiffer Publishing.